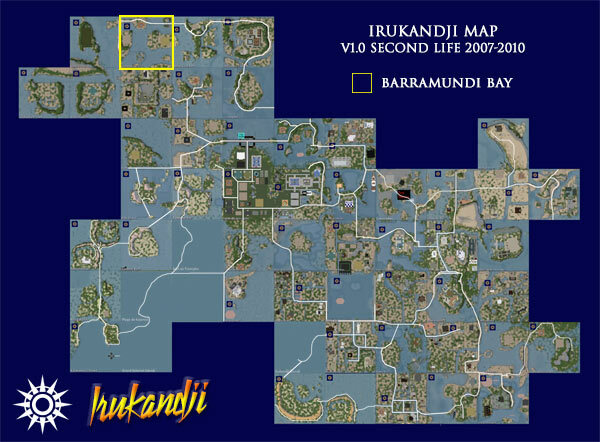 Barramundi Bay was part of Jillaroo State, in the far northwestern corner of the Irukandji Continent. Barramundi Bay was light residential, sharing its southern beach with the north shore of Jackaroo Island. A long underwater section of the Trans Irukandji Causeway extended east-west from Captain Cook Reef to Tuvalu Straits. Clockwise from east, its neighbouring regions were Captain Cook Reef, Tanawayo Bay, Jackaroo Island, Yeppoon Atolls, and Tuvalu Straits. Barramundi Bay was hand terraformed. No photographs have yet surfaced of Barramundi Bay. If you visited and took photos and wish to share them on this page, please let me know via the comment section below.